I am making barbequed Jamaican chicken this weekend and, with fewer restrictions to my cooking than normal, I can pack my dishes with fruit. Parboiling is a way to speed up the cooking process. Warm half-cooked potatoes absorb more of the marinade and roast in less time. Potatoes burnt on the outside and raw on the inside is not the dining experience that you are looking for. Note: Unless that is how your mother made them. I had a friend in college and his mother cooked just that way. Of course, he also thought that a frozen submarine sandwich was haute cuisine. After Dinner Note: I put the mango strips in with the potatoes at the beginning of the roasting time. Some of the mango pieces cooked to the point of being a fruit sauce, this was unintended, but worked very well. 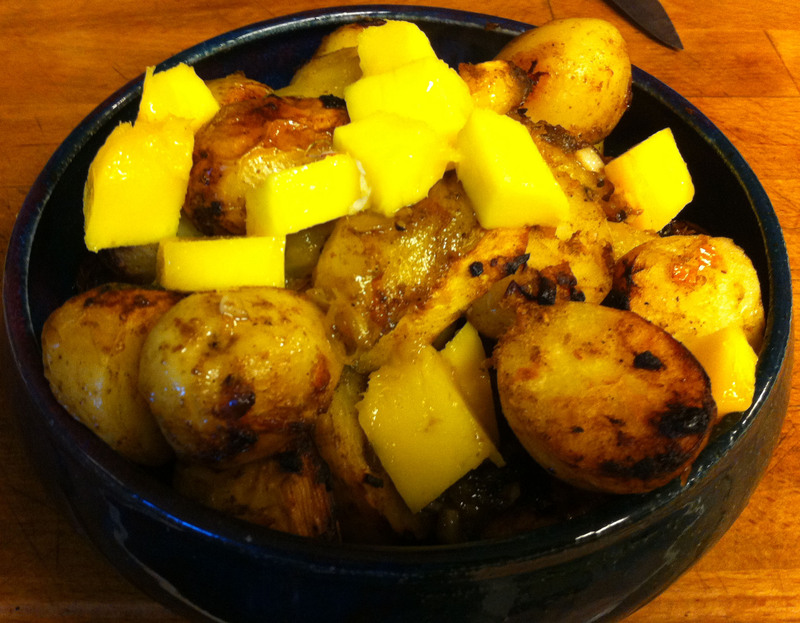 If you do not want your mango cooked to death scatter them over the potatoes after 15 minutes in the oven. 1. Cut larger potatoes in half so that most pieces are ¾ to 1 inch in diameter. Tip: I like to use Dutch Yellows, but you may use any waxy potato you prefer. 2. Put the potatoes in a pot, cover with water and boil for ten minutes. 3. While the potatoes are boiling, zest and juice the lime and reserve for later. 4. Drain the potatoes and reserve in a bowl. 5. Add the butter to the pot over medium heat. When the butter stops foaming, add the garlic. 6. After one minute, add the coriander, allspice, black pepper, nutmeg and mace. Cook until fragrant, about 20 seconds. 7. Add the lime juice, zest and most of the mango and cook for 30 seconds more. Tip: Reserve a few slices of the mango. Dice these and use as a garnish at the end of cooking. 8. Add the potatoes and toss to coat. 9. Using a slotted spoon, transfer the potatoes and mango to a small baking pan. Spoon any sauce over the potatoes. 10. Bake the potatoes for 20-30 minutes at 450 F°. Stir the potatoes once or twice and spoon any over the potatoes. Tip: If the potatoes are not getting brown and crusty enough switch to the broiler element for the last 5 minutes. 14. When the potatoes are brown and crusty and a knife slides easily into the biggest potato, remove to a serving bowl and garnish with the remaining mango.